I've been a Doctor Who fan since Tom Baker was the Doctor in the mid-70s. I have fond memories of watching the Doctor and Leela on PBS in Chicago up into the early 80s. Since there's been 7 new Doctors, the latest of which has become an instant classic among the majority of the viewing audience. I was skeptical at first. It was hard to swallow that what looked like this kid Matt Smith, could possibly take on the role of the Doctor. Saturday marked the end of this all new first season with Matt Smith as the Doctor, and I have to say I'm really impressed. It has been an excellent ride, and if there were an skeptics before the season began, they should all be believers by now. This kid is definitely the Doctor. 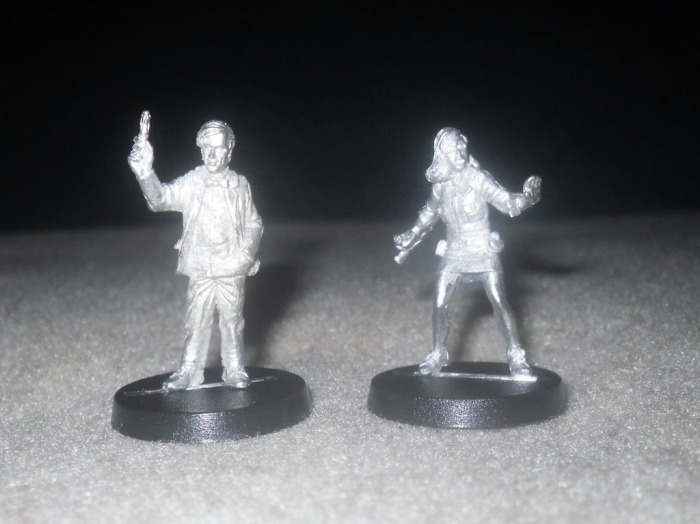 What I'm here to talk about today, are two really fantastic 28mm figures from Crooked Dice Game Design Studio, which resemble two of the most notable Doctor Who series characters. 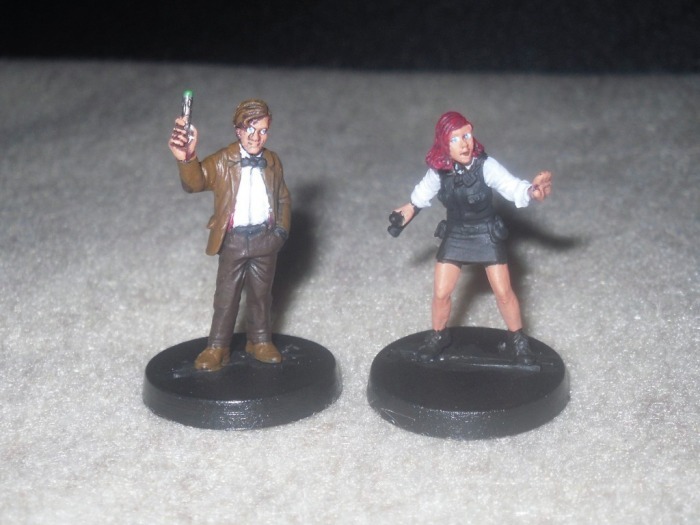 Tweedy Mattison and May Killan are both 28mm figures sculpted by Kev White, and are the first two figures from Crooked Dice, which just so happen to look a lot like Matt Smith as the Doctor, and Karen Gillan as Amy Pond from this latest season of Doctor Who. I'm impressed, this really looks like the kid, the hairdo is spot on too. He's holding the signature sonic screw-driver, he has a bow-tie, and is even wearing a tweed jacket with elbow pads and all. He sure looks a lot like the 11th Doctor. May is dressed as Amy was in the first episode of this latest season, as a kiss-a-gram police officer, complete with night-stick and all. She's quite nice, but I think I'd rather have seen her dressed differently, like in one of the short skirts she's been wearing in the later episodes of this season, along with the little dress jackets. It's definitely a nice figure, but the clothing selection wouldn't have been my first choice. Nonetheless, it does capture a moment in time (no pun intended) quite well, and that's a memorable outfit for sure. So I can see why they might have chosen it over any other possible outfits. Tweedy and May both are single cast pieces, so there are no parts to glue on, I found no flash, and the mold lines were very minimal. Therefore, there was very minor mold line clean up. These were ready for primer in a simple mater of minutes after taking them out of the packaging. I'm yet to see figures this nice from such a small, upstart company too. Kudos goes out to Crooked dice for getting off to a really good start with these pieces. 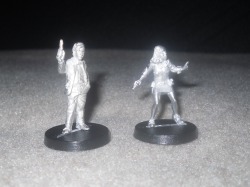 You can order the set of Tweedy Mattison and May Killan for 7 GBP direct from the Crooked Dice online stop, or 4 GBP each individually. They're worth every penny. A closer inspection of their website site reveals a really nice green of what they're calling London Teen Daisy Taylor, which resembles who I think is the hottest Doctor babe ever, Rose Tyler (played by actress Billie Piper). They just started to accept pre-orders for Daisy. They also have some greens displayed for what they're calling Robo-Rodents, which don't ring a bell with me as having been Doctor Who foes, but they look to be some sort of a sci-fi foe. Those also recently became available for pre-order. There's also a nice collection of .PDF files you can download under the Support section, which contain scenarios based on almost every episode from this latest season of Doctor Who to be used with the Doctor Who Miniatures Game rule-set, which is also a free download. Definitely check it out, if you haven't already, it's a fantastic free miniatures skirmish game. 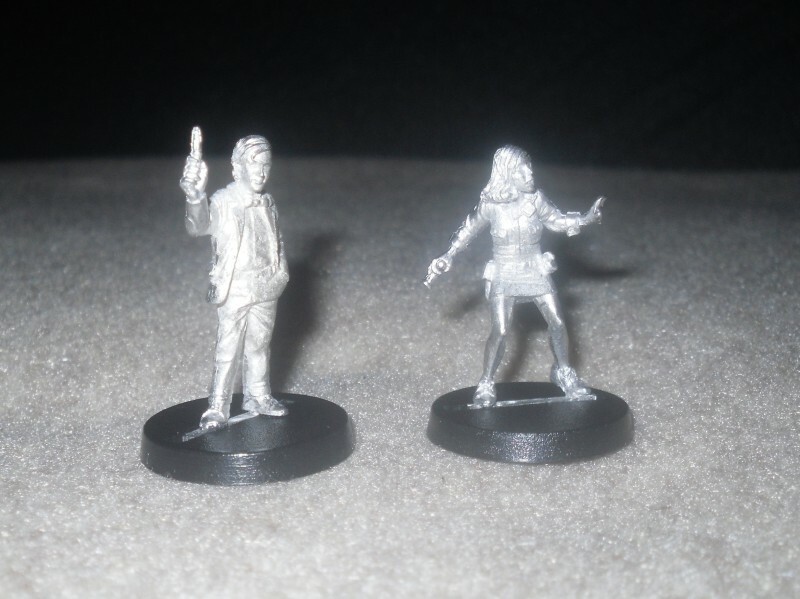 Another project they're working on is called 7TV Inch High Spy-Fi, which is a miniatures skirmish rule-set inspired by 60s and 70s cult action TV shows. The first thing that comes to mind is the Mod Squad, Mission Impossible, Get Smart, Avengers and the entire Austin Powers series which made fun of that era featuring spies, smokin' hot chicks in tight pants, set within the "Make Love not War" movement era. There was a PC game that really captured the essence of just that too called The Operative: No One Lives Forever. If it turns out anything like any of the above, it should be great fun, and I look forward to it. WarGameGuru - Who is behind Crooked Dice Game Design Studios, and how did it all come about? Graeme Dawson - Crooked Dice is a partnership between myself and long time Doctor Who Miniatures Game contributor Karl Perrotton. We share similar interests (wargaming, old sci-fi TV) and decided to produce a set of rules compatible with the DWMG, and figures like-minded wargamers might like. We live at opposite ends of the UK, so most of our dealing are done via email, although we do manage to get together occasionally for a pint. WarGameGuru - So what other sculpts are in the works? Graeme Dawson - Release 2 has just gone to pre-order; this comprises London teen Daisy Taylor and two tiny robotic rodents. Next up will be an Alien Minion with 3 head options (pig hybrid, tentacles alien face and mannequin) dressed in a handy generic boiler suit and a sprue of bits to cyber-convert suitable models, including the minion – heads, arms and a chest unit. After that it’s Astronauts with various helmeted/unhelmeted/undead head options, possibly scary statues then more personality figures. Harkness, or even classic Doctors like Tom Baker, K-9 and the like? Graeme Dawson - Torchwood and Doctor Who are popular with gamers, who will have to keep an eye on our releases to see if we do anything they might like. Lots of stuff is covered by the BBC’s intellectual property rights, so we’re unlikely to produce a K9 or Daleks for example. being like a more campy Get Smart? Graeme Dawson - The game is written slightly tongue in cheek, like the James Bond films or The Avengers. That said it’s a versatile rule set capable of playing all styles of games from straight hard cop action through to spoof stuff like Austin Powers and Get Smart. WarGameGuru - What are the distribution plans for 7TV? 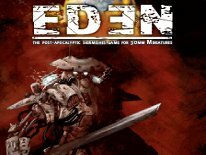 Graeme Dawson - We plan on selling it as a PDF and an actual printed rulebook. Specifics on each format will be decided slightly further down the road. Graeme Dawson - As a tiny concern, we might get out only 12-16 models in a year, so choosing carefully is the key. Hopefully everything we produce can work for both 7TV and the wider sci-fi gamer. The rules are deliciously evocative so we hope to work up to a small but exciting range of spies, villains and a supporting cast of expendables. WarGameGuru - What's the current launch date for 7TV? Graeme Dawson - We’re planning for a late 2010 release. The rules are being worked on to ensure maximum spy-fi per page, then we will get the layout work done and art in. Good progress but still lots to do!